Having worked with the likes of AO.com and Missguided, Ciaran has some strong experience under his belt. He looks after the paid search campaigns, which includes keyword research, writing ad copy and developing strong bidding strategies. When he was nine, Ciaran appeared on the Saturday morning TV show ‘Run the Risk’. Black Friday is possibly the most important shopping event of the year. 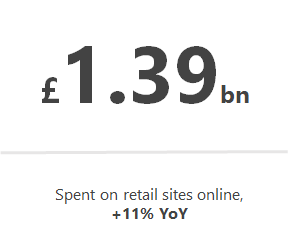 Last year, the UK’s online retailers earned a whopping £1.4bn over the Black Friday weekend alone. This leads to an enormous amount of pressure on digital marketers, who find their ambitious sales targets jumping up year on year with each previous success. UK retailers like John Lewis and Dixons Carphone are used to winning big on Black Friday — which puts enormous pressure on marketers. John Lewis regularly sees a strong Black Friday sales performance. So what can be done to ensure that PPC managers and executives hit those inflated targets? Before we dig into tactics, we need first to understand the broader trend of Black Friday. One of the great things about working in a fast-paced world is that we can generate key learnings pretty rapidly. 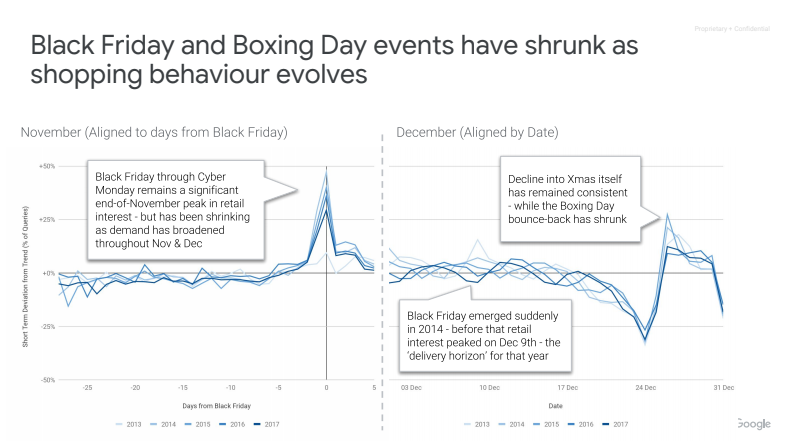 The Bring PPC team have helped me analyse all the available data to determine some of the key trends about the Black Friday period year on year. There have been murmurings from time to time that, despite its successes, the future of Black Friday is questionable, with some asserting it’s already hit its peak. There is some truth to this: Black Friday peak is in decline. Source: Google, ‘Peak Retail Insights’ Report 2018. 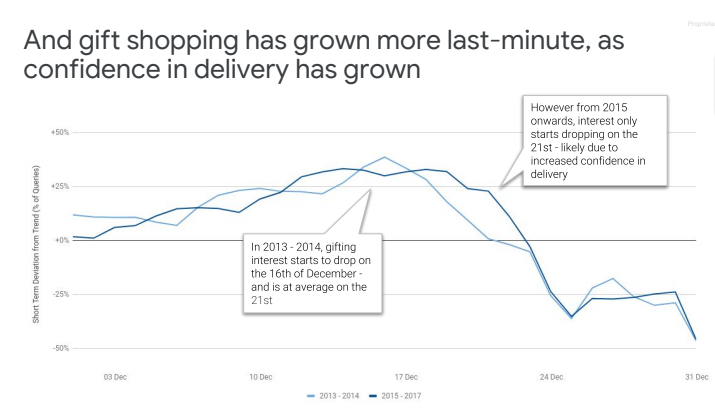 However, data shows that the demand in the weeks surrounding Black Friday — i.e. 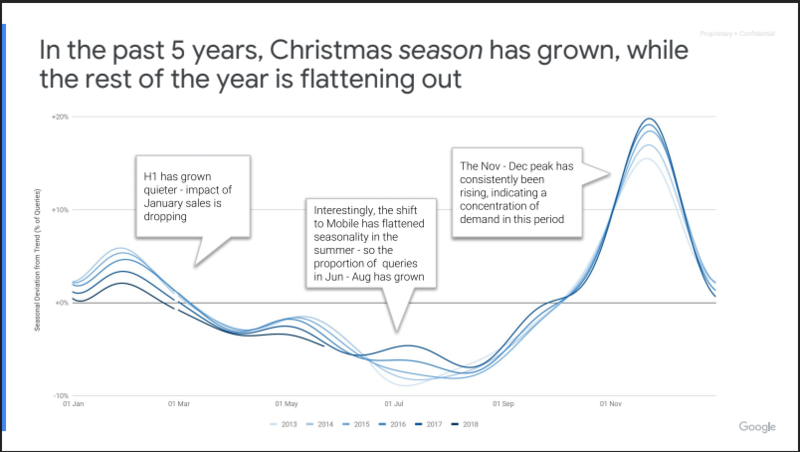 the holiday season as a whole — will probably continue to grow, with 2018 set to be yet another record year. What has changed is the demand throughout the rest of the year. As more and more people anticipate incredible deals around Black Friday, they tend to shop less at other times. 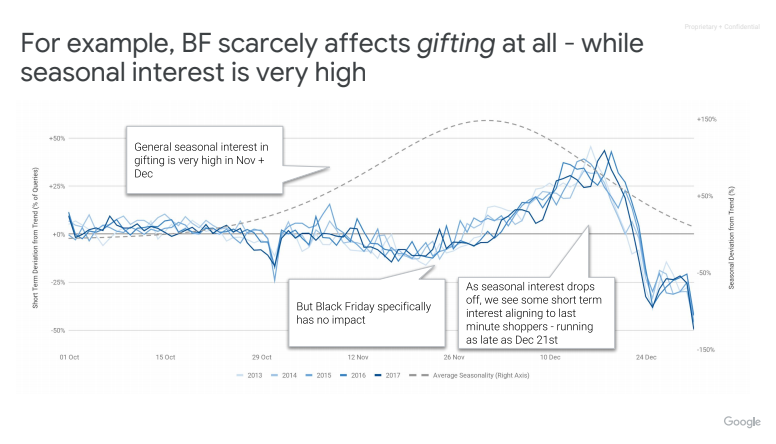 It’s also worth noting that Black Friday shoppers appear to be in the market for items for themselves since the Black Friday peak has no effect on seasonal trends for gifting. One of the key trends that have accompanied the rise of Black Friday over the last decade is the shift from in-store shopping to online sales instead. As it turns out, people are doing their research far before the peak period — but an increasing trust in fast and reliable delivery means that people are waiting later to buy. 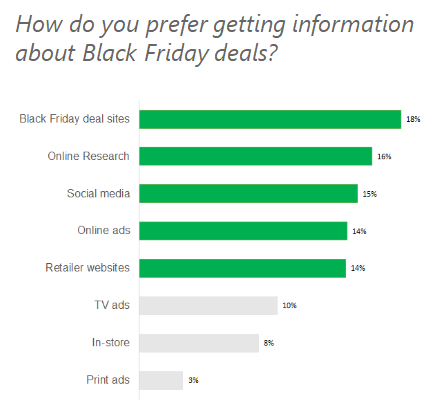 This shift towards earlier research has stretched Black Friday out from the one-day event that it used to be to week or even month-long retail events. Last year, Amazon’s Black Friday sale started a week earlier than Black Friday itself, with deals going live on the 14th November. 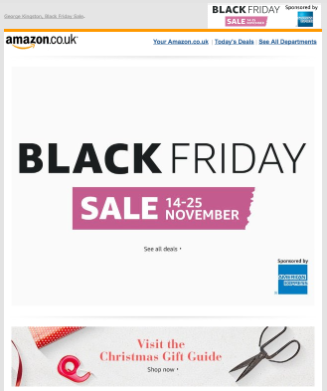 A pop-up ad for Amazon’s 2017 Black Friday sale. That means that Amazon’s Black Friday lasted for nearly 11 days in total — and it doesn’t look likely to change this time around. The truth is that retailers like Amazon and Asda are now spreading out the sale partly due to necessity. The popularity of the retail holiday means that stores need to protect themselves from website meltdowns and in-store chaos. Easing congestion by spreading out the deals is one of the best ways to do this. 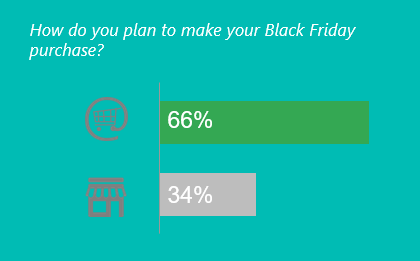 It’s also worth noting that consumers themselves have said that they would rather make Black Friday purchases online than in-store. And since websites have less of a captive audience than brick-and-mortar stores, users are more likely to compare and meditate over a purchase to make sure they’re getting the very best deal. 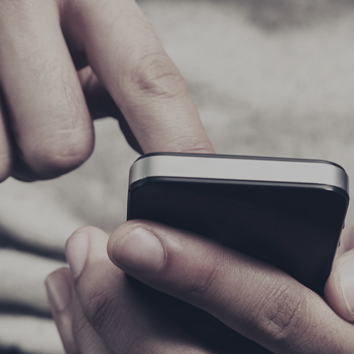 The shoppers that are hitting the high street are spending more and more time online while they do so via mobile devices, so customers can find online deals even when they’re in the store. With more and more shoppers expecting longer Black Friday deals and turning to online retailers to get them, PPC experts need to step up to the plate to meet the extraordinary demand. But never fear. I’ve put together the five key areas I believe you need to perfect to dominate this year’s Black Friday sales— and some of them are easier to do than you might think. First thing’s first — the same rules apply when you’re running ads during peak as do during the off-season. If your account is in a shambles, you’ll struggle to get any shoppers through to your site, regardless of how juicy the deals are. Below, we’ve put together a visualisation to show you what specifically you should think about in each area. Quality score — Put the customers at the centre of everything you do, and remember: consistency is key. Ensure that your ad copy is reflective of the user search query and regularly review landing pages to ensure they’re engaging enough to keep your bounce rate low. Make sure your ad group Campaigns are grouped to similarly themed keywords. Invest in generic keywords — Black Friday is a free-for-all, and brand loyalty will mean little when deals are popping up left right and centre. Make sure you’re investing spend into your generic keyword groups to get your deals in front of shoppers who are researching the market for specific products they’re interested in. Audience – Overlay audiences to your campaigns to improve targeting and allow user signals to optimize your bidding strategy, target similar audiences, and retarget users that engage with your products. Ad extensions — Sitelinks, callouts, price extensions and structured snippets are all going to help your ads stand out and improve CTR. Use all the real estate you have to provide users with as much relevant information as possible and highlight important parts of your proposition: any vagueness can work against you in sealing the deal. Tracking and measurement — Before you go live with your sales, it’s worth doing a quick refresh of your tracking through to GA and your CRM to ensure Ads data is being recorded Also remember that Ads Data Hub now offers anonymised cross-device impression-level data from campaigns running on YouTube, DoubleClick and Google Display Network. Pretty nifty stuff — more on that later. As we get closer to 2019 — the same year that Harrison Ford’s Rick Deckard was chasing down replicants in Blade Runner’s dystopian Los Angeles — the phrase that’s on everybody’s lips is “machine learning”. If you’re not embracing machine learning in your bidding strategy, you’re at risk of falling behind. No matter how good your manual process might be, it can’t compete with an account that can instantly react to the changing market. 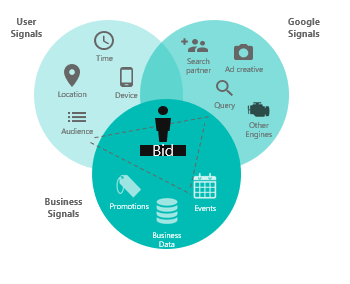 If you’re not already familiar with it, get acquainted with Smart Bidding. Smart Bidding uses machine learning to optimise the conversion rate and value of your ads. Target CPA — Automatically sets bids to help you get as many conversions as possible at the target CPA that you set. 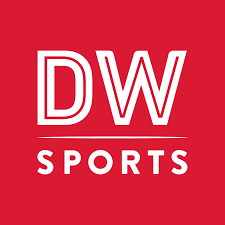 It uses historical information about your campaign and analyses contextual signals at the time of auction to find the best CPC bid for each of your ads. You can still set maximum and minimum bid limits. Target ROAS — Bids based on a target return on ad spend (ROAS). Target ROAS predicts future conversion values based on the historic values you report through conversion tracking. Google Ads then sets a max CPC to try and achieve an average return on ad spend equal to your target. Bear in mind that you’ll need to have at least 15 conversions from your ad campaign in the last 30 days to use Target ROAS. Maximise Conversions — This strategy is all about getting the highest number of conversions possible for your budget, regardless of value. Before switching to Maximise Conversions, be aware that Maximise Conversions will try to spend your full daily budget, meaning it could increase spend significantly if you’re currently spending less than your full budget. Enhanced CPC (ECPC) — Designed to help you get more conversion from manual bidding. ECPC adjusts your bids for clicks that seem more likely to lead to a sale or conversion on your website. Unlike the Target CPA model, ECPC is constrained by your maximum CPC bids. IF functions allow you to create text ads that change when a specific condition has been met. You can include IF functions anywhere in your text ad except for the Final URL field. You can also add user lists from your account to target specific user groups you’ve outlined for your campaigns. In the age of personalisation, it’s naive to believe in a ‘one-size-fits-all’ strategy. But there are still plenty of Google Ads accounts that fail to account for the different buying stages that their customers are at. People who’ve bought before — These customers match the IDs that you pull through from your CRM. You can split out this group to increase bids on high-value purchasers and lower CPCs on those that are low-value. People who’ve yet to buy — This group are on the verge of purchasing, so you should tailor your ads to giving them a nudge to get them over the line. Use product-based RLSAs for product and basket viewers, and related products for those who’ve purchased previously. People who’ve yet to interact — Build up sub-groups based on behavioural similarities to the demographics in the sub-categories in the previous two groups. These will coincide with your brand awareness campaigns. Yes, Black Friday can feel manic and stressful and — if you’re unprepared — downright scary. But if you’re willing to put a little extra work into your strategy before the big day comes around, you might just find it’s a dream come true. How are you planning on staying one step ahead this Black Friday? Let us know in the comments below.